Most “prophecy teachers” today place the battle of Gog and Magog just before, or at the very beginning, of the Tribulation Period. 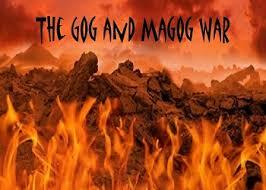 Others, however, have the battle of Armageddon first and the battle of Gog and Magog as the final conflict. Of course, being the contrarian that I am, I view and interpret this battle completely opposite from the popular consensus. I am a firm believer in interpreting Scripture in its appropriate context. In this scenario, the proper context is that of a historical context. To begin with, this “battle” is described in Ezekiel 38 and 39. These chapters immediately follow chapter 37 which gives a vivid picture of the vision of dry bones. God reveals to Ezekiel that this valley of bones represents “the whole house of Israel.” Since Ezekiel prophesied during the time of the Captivity, this vision portrays how God will again deliver Israel and bring her back to the land of promise. Additionally, this chapter alludes to the time when “David” will again be a king over them, an obvious reference to Jesus, the King of the Jews. The apostles make reference to this chapter in Romans 11:20-27; Ephesians 2:11-22; and Acts 15:14-17. Therefore, we have both a historical and a spiritual fulfillment. Before I begin to explain my position and interpretation of these two chapters in Ezekiel, I must reveal the parameters upon which I interpret Old Testament prophecies. In Matthew 11:13, Jesus stated that, “For all the prophets and the law prophesied until John.” Luke records it this way: “The law and the prophets were until John; since that time the kingdom of God is preached, and every man presseth into it.” I believe that practically all prophecies either had relevance to the immediate hearers of the prophet, or else, they culminated and focused upon one personage, Jesus. John was the last in line to do so. It is upon this premise that I view all the Old Testament prophecies. I believe such a foundation of hermeneutics would alleviate much confusion in understanding many Biblical passages. Let us begin. The chapter begins with God proclaiming judgment upon “Gog, the land of Magog.” The prophecy relates how Gog will come upon Israel while she is at peace in un-walled cities. The time frame is after Israel has been brought back from her captivity. The purpose of this attack was “to take a spoil.” The chapter describes the inhabitants as living in desolate places. The prophecy tells how that God would be the One who vanquishes these attackers. In fact, their dead would all be buried in a valley called “the valley of Hamon-gog.” The readers should better acquaint themselves with these two chapters by diligent reading and study. It is not the goal of this short study to give a detailed commentary. Rather, I want to introduce to the reader a more plausible guide to help in their understanding of this perplexing passage. We will do this by comparing portions of the book of Esther with the chapters in Ezekiel. Why Esther? The Jews went into captivity in about 606 B.C. and returned to their homeland in 536 B.C. by a decree of Cyrus. They returned to a land that was devastated by war. Everything was in ruin and rubble. Ezekiel lived and prophesied during the time of the Captivity. Esther, on the other hand, records a period of time some 50 plus years after the return from the Jewish Captivity. Many Jews were born in their land of captivity, consequently, many never returned back to Canaan but remained in the land of their birthplace. By the way, the reader must read the short book of Esther in order to get the proper historical perspective. Although the word “God” is never mentioned in this book (the only book in the Bible to do this), His providence is the unifying thread throughout this beautiful story. Three times in human history Satan has tried to abort God’s promise of redemption as recorded in Genesis 3:15. The first was during the time of Noah when all of human civilization had succumbed to sin, except for just eight people. The second time was during the times of the book of Esther. The third time, of course, was when Herod killed all the babies is Bethlehem. Some would count the crucifixion as the fourth attempt, but Satan had no say in that instance. Jesus willingly laid down his life according to the will of the Father for the sins of the world. Let’s take a closer look at the second failed attempt as recorded in the book of Esther. First, let’s try and find the identity of “Gog, the chief prince.” Remember, earlier, I made mention of the fact that there exists a Hebrew manuscript that referred to Haman as “the Gogite.” In other words, Haman’s ancestral roots were in the land of Gog. Also, in Esther 3:1, the Bible declares that king Ahasuerus promoted Haman “above all the princes.” In other words, Haman was the “chief prince”, the term applied to Gog in Ezekiel 38:1. We have already mentioned the timeframe of this momentous battle. It would be after the Jewish captivity, during a period of peace and tranquility, and it would be when the land was “desolate.” If you read the books of Ezra and Nehemiah, which recorded a time period which corresponded to that of Esther, then you would notice a definite parallel. The land was in utter ruin and chaos by the Babylonian armies nearly 150 years prior. One of Haman’s goals for his sinister plan was “to take a spoil.” These are the exact words as found in Ezekiel 38:12. Notice, too, the name of the burial place of those enemies of the Jews: the valley of Hamon-gog. This appears to be a thinly-veiled play on words for Haman’s appellative, “Haman, the Gogite.” As already mentioned, Haman was hung on the very gallows on which he had built for Mordecai. This would explain the words as found in Ezekiel 39:4, “…I will give thee unto the ravenous birds of every sort…” There is a parallel of this phrase found in Genesis 40:19 where Joseph interprets the dream of Pharaoh’s chief baker. “Yet within three days shall Pharaoh lift thy head from off thee, and shall hang thee on a tree; and the birds shall eat thy flesh from off thee.” Obviously, the chief baker didn’t get very much sleep for the next few days. Some would object to this historical interpretation, since Ezekiel uses such phrases as: “latter years” and “latter days”. Many prophecy teachers automatically place any passage of scripture that refers to the “latter” days, years, or times to the end of human history. To put it bluntly, they are wrong. These phases must be kept in the context in which they are used. For instance, in Ezekiel 38:8 the prophet states: “…in the latter years thou shalt come into the land that is brought back from the sword…” This is an obvious reference to the return of the Jews from their 70 year captivity as a result of the Babylonian conquest. Thus, this is the time frame of the prophecy in chapters 38 and 39. Dispensationalists take many Old Testament prophecies and interject them some 2500 years into the future. This leaves no relevance to the people who lived at the time of these prophetic utterances. So, the battle of Gog and Magog is not some mystical conflict millennia removed from the people that lived at the time of the prophecy, but rather, it was something that would impact their descendants just a few generations away. This “battle” was one which Satan lost. He was not successful in aborting God’s plan for a future redemption of mankind. God maintained that Chosen Seed which would one day bring forth the Redeemer.